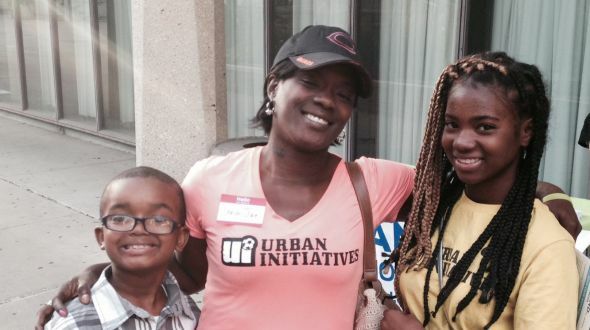 Urban Initiatives – Meet Coach Jamila Davey! Sherman School of Excellence Work to Play Assistant Coach Jamila Davey has been a part of the Urban Initiatives family since 2010! Coach Brandon recently sat down with Coach “J” to talk about her experience as an Assistant Coach these past 5 years. Coach Brandon: What’s your favorite UI memory? Coach J: Uhhmm I’d have to say meeting Jim for the first time lol. It was my first year and the staff was really small and I was just amazed how something so positive could start from such a small group of people. UI gave me that strength to push forward with the program and give the kids all I could teach them. To see people come from outside the community and give so much back to students was amazing to me. It was something I definitely wanted to be apart of. Coach Brandon: What was the hardest lesson to teach the kids? Coach J: Unity!! Trying to get them to work together was a job! Just getting them to learn those concepts of sticking together and becoming a team wasn’t something that came easy. Unity starts at home and from outside environments for them and let’s face it, they don’t have many good examples in today’s society. It’s something they’re not getting out there so I guess that’s where we come in. I appreciated having a job where I could advocate unity within our schools and the community. Coach Brandon: In your opinion what is the biggest impact of the program? Coach J: The diversity! A lot of the kids have never been offered these types of programs and opportunities like the Multi-Cultural Cup or some of the other events they’ve had. Being able to be in situations where they are interacting with other kids on a positive note I thought was great! I think our kids needed to see the diversity out there and understanding that “hey, we are all on the same team here.” There’s so much more to life and participating in these events may help them realize, “I can make it too.” It’s a great thing to give them that opportunity. I appreciate a program that can expose kids to things that can really uplift and inspire them. Coach Brandon: What’s changed the most with UI since you started? Coach J: The staff! That’s definitely increased as well as the amount of schools. Those are the main things I’ve notice, which I think is great. The turnover can be hard because I’ve seen some really good ones come and go. But it’s good to see different people coming together for this cause so I definitely can’t complain. It was cool for me to help pass along that knowledge as well. Coach Brandon: What changes have you seen in your family since being involved with UI? Coach J: I’ve seen my daughter become a role model and understand what a Team Captain means and know that her peers are watching her actions so you have to be that much more responsible in the decisions you make. I think it was great for her to learn what it means to be a leader and it is something I’m proud of. Seeing her flourish in this program has made it that much more meaningful to me. It was ultimately a great bonding experience for us as well. Having that mom-daughter relationship become player-coach was really cool. Coach Brandon: What roles do UI kids have outside of practice in Sherman? Coach J: Some are active in the school as far as volunteering in after school activities and what not. Some students would help teacher’s grade papers or make board designs for the hallway in school. They also did a garden outside of the building, which was actually an activity they took the time to do on the weekend. Coach Brandon: When was that? Coach J: That was during spring break for 6th, 7th, and 8th graders last year. They also painted benches outside and it was really beautiful and amazing to see how many of the UI kids came out to help. Coach Brandon: What advice would you give future coaches? Coach J: To be open-minded and tap into their inner child. Don’t be afraid to have fun! I would always tell the kids to get “noodly” just to get their attention back. Just doing something goofy sometimes to keep things fun and fresh is important. But yeah, be open to your inner child because it’s so much fun lol. Coach Brandon: How long have you been involved with UI again? Coach J: I want to say 5 years and a lot has changed since then obviously. It was probably only 15 schools back then. Also seeing that growth over the years has been great! It makes you realize how effective and important this work really is. Coach Brandon: Lastly, what will you miss the most? Coach J: Just being there with the kids. Seeing how happy they are and how unafraid they were to embarrass themselves trying the Messi or something lol. They are so small but they try so hard. They are almost little adults and seeing them get mad and tempers flaring is difficult. But I’ve really seen the joy students get out of the Urban Initiatives programs. I will miss seeing that the most.